It's that time of the week again... (my favorite time)! It's Friday's Nail Files link-up hosted by Tara & Vicki. I love seeing everyone's nails and adding polishes to my wish list. First I'm showing Revlon's Perplex. I wore this Monday - Wednesday. I used China Glaze Phat Santa & Revlon Silver Dollar. We'll see how well these stand up to house cleaning, cooking & baking this weekend. I'm so excited. I'm making my mommy's lasagna recipe for dinner tomorrow. I think for dessert, I may might make red velvet cake. YUM! I love the red & silver! So cute. Love the first color! Your VDay nails are so cute! 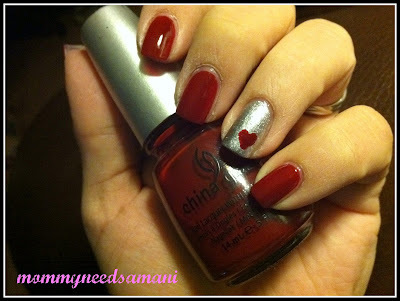 what a cute valentines day mani!